OAKHURST — Will it be the library, the lounge, the kitchen or the conservatory? Plum with a knife, Mustard with a rope, or Peacock with a revolver? 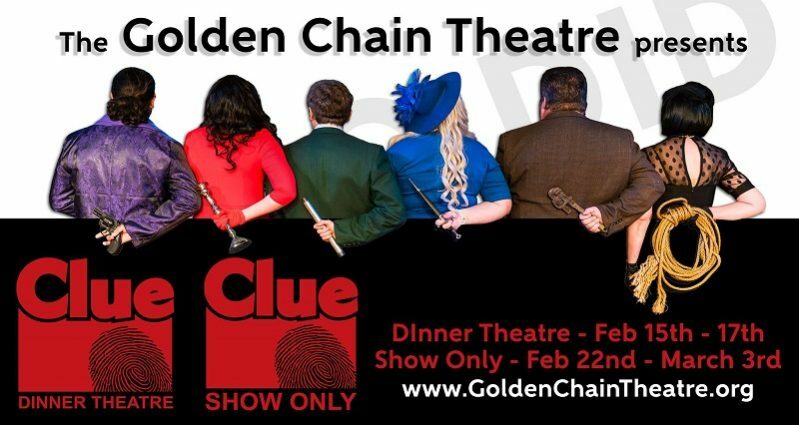 Whom-or-whatever it turns out to be, theater-goers are virtually guaranteed to have the time of their lives figuring out the rules of death, as the Golden Chain Theatre presents an interactive whodunit, Clue. And there are 216 possible solutions! 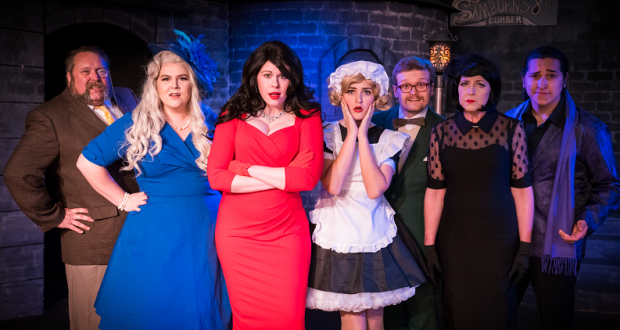 That’s right — the internationally popular game is now a fun-filled production which brings the world’s best-known suspects to life, and lets the audience play along with the cast after having chosen the cards to determine the outcome of the madcap play. Clue is rated PG-13 for theme, gunshots, sexual innuendo and mild language, all while comic antics, witty quips, and frantic mayhem carry the investigation from room to room. Set on a dark and stormy night as the evening’s host turns up toes-up, the show runs three weekends. On Friday, Saturday, and Sunday, Feb. 15 – 17, there’s something very special going on, as guests are invited to enjoy a complete three course meal along with the riveting show. 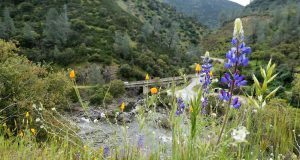 Catered by The Wild Fig,dinner will include appetizers, spring salad with candied pecans, lemon tarragon chicken breast, rice pilaf, seasonal vegetable, dinner rolls and a chocolate ganache cake for dessert. There’s a no-host bar and a vegetarian option will be provided upon request by calling (559) 683-7112. Doors open at 6 p.m., dinner service starts at 7 p.m. and the program runs until 9:30 p.m. Seating is limited. For just the show, without the dinner, make reservations for any of the performances running Feb. 22 through Mar. 3, starting at 6 p.m. on Fridays and Saturdays. The Sunday matinee starts at 2 p.m. 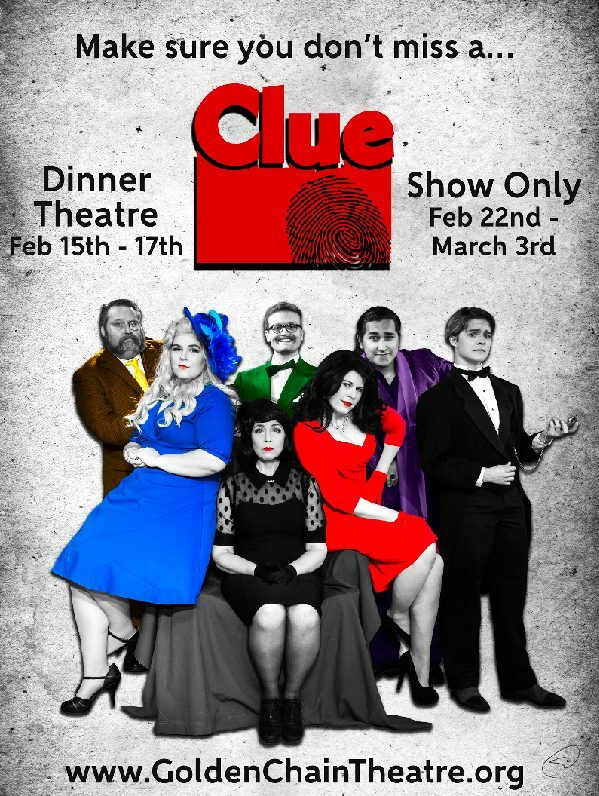 The cast of Clue includes Lyric Gianni, Paige Ferbrache, Lianna Garza, Leonard Brown, Miranda Simonich, Melinda Rich, Maxwell Barclay, Jamie Letwinch, Eben Hammond, Chris Heard, Tate Obernolte, Jason Walle, and Cassie Longcor. Clue is directed by Jennifer Janine. Scarlet in the ballroom with a candlestick? You’ll have to buy a ticket and find out. Golden Chain Theatre for tickets to Clue.